Sainte-Adresse is a seaside resort located near Le Havre, very popular during the Belle Epoque with celebrities and the impressionist painters. At the seaside you can find a pebbly and sandy beach lined by a seafront promenade that offers a unique view of the Seine estuary. A Sainte-Adresse enjoy a seaview holiday rental. Apartment 45 sqm located on the 2nd floor, kitchen, bedroom with 1 bed 160 and a living / bedroom with 2 beds 80. Bathroom and toilet. TV, Wifi. 1 Bedroom(s), 0 double bed(s). This property is 6 minutes walk from the beach. 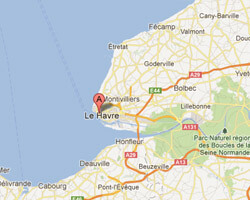 Located 500 metres from the beach, LA MER EN VILLE offers accommodation 500 metres from the centre of Le Havre. The apartment is 16 km from Deauville. Free WiFi is provided . This appartment of 45m2 is 1 minute walk from the beach. 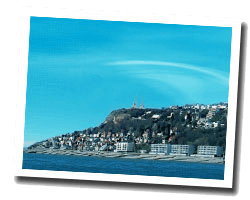 Offering a sun terrace and views of the sea, La Villa M.Talbot Appartements Vue Mer is situated in Le Havre, 30 metres from the beach. 1 Bedroom(s), 1 double bed(s). short stays possibility.